Veromanduorum Eorum Que Confinium Exactissima Descriptio. 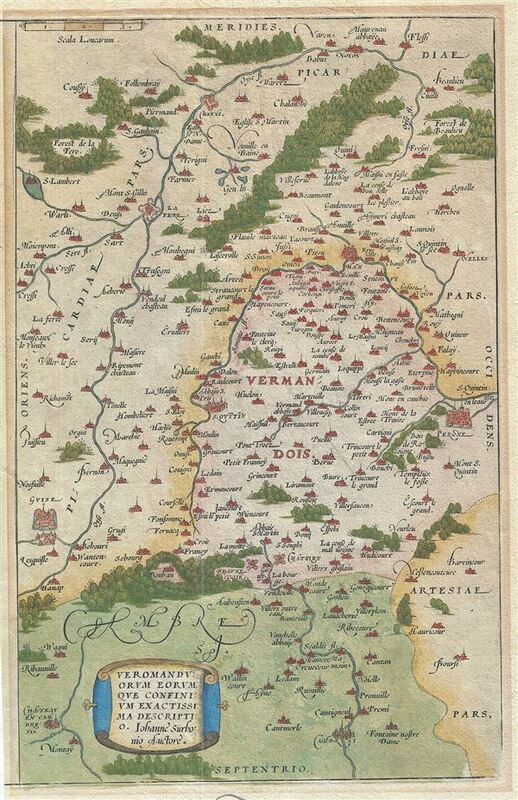 This is a rare 1579 Abraham Ortelius map Oise, Picardy, Francy. Oriented to the South and centered on Saint Quentin, the map covers from Cambrai to Noyon (Noviomagus Veromanduorum) and from Guise to Perone. The cathedral of Cambrai, in the department of Nord is famous for the composers it employed in the 15th and 16th centuries. Among them were Philippe de Monte, Johannes Lupi, Ockeghem and others. This area is also known for its production of Maroilles, a cow's milk cheese. This cheese is produced in rectangular blocks with a moist orange-red washed rind and a strong, distinct odor. The map features a decorative title cartouche in the lower left quadrant. Shows the region in wonderful detail with attention to forests, cities, rivers, villages and other topographical features. Cartographically based on the map by Jean de Surhon this map was published in Antwerp by A. Ortelius in 1579 for issue in his seminal atlas Theatrum Orbis Terrarum. Abraham Ortelius (1527 - 1598) was one of the most important figures in the history of cartography and is most famously credited with the compilation of the seminal 1570 atlas Theatrum Orbis Terrarum, generally considered to be the world's first modern atlas. Ortelius was born in Antwerp and began his cartographic career in 1547 as a typesetter for the Antwerp Guild of St. Luke. In this role Ortelius traveled extensively through Europe where he came into contact with Mercator, under whose influence, he marketed himself as a "scientific geographer". In this course of his long career he published numerous important maps as well as issued several updated editions of his cardinal work, the Theatrum Orbis Terrarum. Late in his career Ortelius was appointed Royal Cartographer to King Phillip II of Spain. On his death in July fourth, 1598, Ortelius' body was buried in St Michael's Præmonstratensian Abbey , Antwerp, where his tombstone reads, Quietis cultor sine lite, uxore, prole. Ortelius A., Theatrum Orbis Terrarum, (Antwerp) 1579. Good. Overall toning. Blank on verso. This map was originally part of a larger sheet on which several maps were printed, consequently the map's printing and plate mark extend off the left hand side of the page.